Power2Save previously published a story written by Reid’s wife, Lisa. In February of 2014, in the hallway of the Baylor Dallas hospital ICU, I was told my wife would need a full liver transplant from a deceased donor to have any chance at survival. Her body was in liver failure which had also caused her kidneys to shut down. Things had transpired quickly over the last 24 hours. We had gone in for what we thought was just a routine gallbladder removal. What the routine surgery and a biopsy of her liver revealed was a one in a million diagnosis. Lisa was diagnosed with Budd- Chiari (blood clots in the hepatic veins), and within eighteen hours was care flown in critical condition, intubated, and placed at the top of the transplant list. This was a heartbreaking, earth-shattering diagnosis to me. Lisa and I were high school sweethearts who a year and a half into our marriage thought we had our whole lives planned out. Now, my bride had roughly 48 hours left to live if she did not receive the gift of life. Aside from my faith, family, and friends I could not have gotten through those moments. I would also like to give a special thank you to the coordinators, OPO’s, nurses, doctors, and surgeons who use their gifts and skills to save and enrich lives on a daily basis. A short ten hours later, I received a call to inform me that there was a healthy liver available for Lisa. It is hard to express the conflict of emotions that a recipient family feels in these moments. A miracle for our family was such a blessing, while simultaneously we knew that another family was going through the most devastating loss. All we could do in that instant was stop and pray for the donor family. After a terrible car accident took the lives of both his daughters, Courtney’s dad, Michael made the selfless decision to donate Courtney’s organs to others in need. 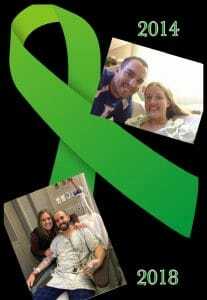 Lisa received the gift of life on February 6, 2014. Our lives were forever changed that day because of the gift of Lisa’s organ donor, Courtney Ray Sterling. From the moment Lisa and I received that precious gift, we promised to spend the rest of our lives glorifying God for His miracle in our lives and honoring our donor Courtney with the way we live. In December of 2018, I (Reid) had the opportunity to pay forward that gift. After learning that one of my good friends, Jon, was in kidney failure and on daily peritoneal dialysis treatments, I talked to Lisa about seeing if I was a match. Understanding exactly how it feels to be a family in need of a miracle, Lisa did not hesitate to offer me support in my decision. 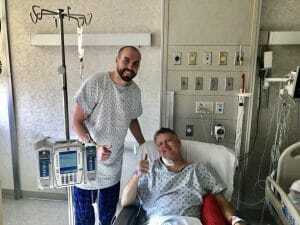 After many different labs, scans, tests, and evaluations I was named a match and donated my kidney to my friend Jon on December 11, 2018. We are both doing well in our recoveries and Jon shares that his numbers show the best kidney function he has had in twenty years! Praise God! Because of the selfless decision of a father in the midst of the worst day and moments of his life, I have been able to experience five more (and counting) years of life with my wife, Lisa! Because of his selfless decision and the impact that Courtney’s gift of life has had on me, I was able to step into the opportunity to pay forward that gift of life to someone else. Signing up to be an organ donor truly is the most selfless decision anyone can make. Our lives are an example of that gift, and we will continue to spread that hope with each day we are given!